G. K. Chesterton was a literary giant of his age. With anexceptional intellect, he wrote about history, politics, economics, philosophy,social and literary criticism, and theology. He published essays, novels, biographies,short stories, and poetry, and the Christian classicsHeretics,Orthodoxy, andThe Everlasting Man, which C. S. Lewiscredits as instrumental in his conversion to Christianity. With much of his finest material out of print or hard to find,modern readers have long needed a standard collection of his best thoughts. KevinBelmonte'sThe Quotable Chestertonbringsthem to you arranged alphabetically by topic, with complete original sourcedocumentation. There are entries from Adventure to Cheese, Politics toEmile Zola, interspersed with essays about Chesterton's life and times.Hundreds of passages drawn from Chesterton's fiction, poetry, essays, and otherbooks showcase a man theNew York Timeshailed as a "brilliant English essayist" and George Bernard Shaw called a"colossal genius." G. K. Chesterton was a literary giant of his age. With an exceptional intellect, he wrote about history, politics, economics, philosophy, social and literary criticism, and theology. He published essays, novels, biographies, short stories, and poetry, and the Christian classics Heretics, Orthodoxy, and The Everlasting Man, which C. S. Lewis credits as instrumental in his conversion to Christianity. With much of his finest material out of print or hard to find, modern readers have long needed a standard collection of his best thoughts. 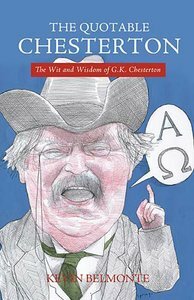 Kevin Belmonte's The Quotable Chesterton brings them to you arranged alphabetically by topic, with complete original source documentation. There are entries from Adventure to Cheese, Politics to mile Zola, interspersed with essays about Chesterton's life and times. Hundreds of passages drawn from Chesterton's fiction, poetry, essays, and other books showcase a man the New York Times hailed as a ?brilliant English essayist? and George Bernard Shaw called a ?colossal genius. ?